made of petroleum, you are. like little night lights in the sky. and constellations placed just right. Indoor skies are best by far! 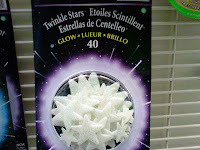 I love those sticky stars! Twinkle ! indeed- saw some lovely stars the other night and a bit of moon, but it was burrrish cold too! Thanks for playing, thanks for this past year of wonderfully fantastic contributions. Your loyal support is very much appreciated. That would be fun to have on the ceiling! Love it! A Northern Michigan sky is hard to beat... but some times I do enjoy the stars on the ceiling too. :) Happy New Year. I got some of those for my kids, but they both thought they were creepy and threw them away.